Very few of us have ever heard of Meibomian Glands Dysfunction (MGD). It is a very common eye condition, affecting many people who do not even realize they have it. Yet, if left untreated, it can lead to extreme discomfort and potentially cause permanent damage to sight. The condition is connected with the production of tears, which keep our eyes moist and healthy. They also affect the clarity of our vision. When there is an imbalance in the composition of tears, dryness, irritation, and blurred vision may occur. So, what is MGD and how do we ensure it does not cause lasting damage? Tears are made up of three components: water, mucus, and meibum. The latter is an oily substance produced by meibomian glands. These glands are named after the German physician Heinrich Meibom, who first described them. They are located on the edge of the upper and lower eyelids–the parts that touch when closing your eyes. Meibum is secreted onto the surface of the eye to prevent the watery component of tears from evaporating too quickly. MGD occurs when there is an abnormality with the glands. That is, a change in the quantity or quality of the oil produced. The gland openings become clogged, so less meibum is released from them. What does get through the blockage can be of a rough texture or appear crusty, and causes irritation. This lack of oil leaves your eyes more susceptible to dry climates, computer use issues, and difficulty reading. It can impact the long-term health of eyes. Unfortunately, age is a contributing factor to becoming more susceptible to blocked glands. We generally have 25-40 of these glands in the upper eyelid and 20-30 in the lower. As we get older, these numbers reduce, as does the amount of meibum produced. Studies estimate that 70% of US citizens above the age of 60 have MGD. Ethnicity is another major factor. Those from an Asian background are three times more likely to contract MGD than those from a European background. Eye makeup (like eyeliner) can clog the openings of the glands, especially if it’s not completely removed before sleeping. Use of beauty products with retinoids (acne or anti-aging creams) can also cause blockages. Research suggests that wearing contact lenses puts you at a slightly higher risk of MGD. But it is still unclear whether they are actually a cause. Some medical issues can also bring on blockages, such as high cholesterol, bacterial infection, conjunctivitis, and other eye diseases. Because there is a lack of oil produced, tears dissipate too fast. This means that they are unable to keep the eyes moist. The eyes become very dry, which is why meibomian glands blockage is major cause of dry eye syndrome. Approximately 86% of those suffering from dry eyes are actually suffering from MGD. Experts are not sure how the two conditions are connected or which comes first. It is possible that inflammation from dry eye causes damage to the glands. However, it could also be the other way around with MGD causing dry eye. 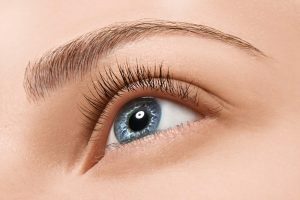 In the early stages, watery eyes may be the only symptom, making differentiation between the two conditions difficult. Due to the severe damage that MGD causes if left untreated, it is important to get an early diagnosis. Although asymptomatic to begin with, irritation, itchiness and a burning sensation can develop as the dysfunction progresses. Many people describe the feeling like having a grain of dust or grit trapped in the eye. The eyelid may appear red and inflamed and the rim may appear rough or uneven. In some cases, there may also be some intermittent blurring of vision. There is no particular symptom that can indicate whether you have a blockage in your meibomian glands. It’s therefore important to see a doctor as soon as possible to gain a diagnosis. Here at the New Jersey Eye Center, we perform an examination of your eyelids to inspect the gland openings. A number of tests are carried out to measure the quality of meibum and check the speed of tear evaporation. It’s the combination of all the results that will lead to the correct diagnosis. In early detection of MGD, there are some simple steps that can be taken. A warm compress can be placed over the eyes for a few minutes twice daily. Heat increases oil production and melts the oil that has solidified in the glands, allowing it to flow more freely. Lightly massage the eyelids with the fingertips, rolling the finger towards the eyelashes. It’s important not to press too hard. Dabbing along the upper and lower eyelash lines with a non-soap cleanser can help unblock gland openings. Your doctor will be able to advise the best product to use which will not cause additional problems. Some patients benefit from taking supplements containing omega-3 fatty acids. They may boost the quality of meibum as they have anti-inflammatory properties. Again, speak with your doctor about whether they may help you. In more advanced stages of MGD, your doctor may prescribe additional eye drops, creams, sprays or pills. These may contain antibiotics, lubricants or steroids depending on your individual requirements. During the diagnosis process, your doctor may carry out a Lipiscan. This gives a clear, digital image of the meibomian glands. If the severity of the blockage is extreme, they may recommend an alternative treatment. The New Jersey Eye Center, under direction of Dr. James Dello Russo, uses Lipiflow on many patients suffering from MGD. Lipiflow is the only FDA approved procedure for the condition. A device is used to apply heat to the inner eyelids whilst massaging the eyes with pulsating squeezes. This gently removes blockages from the glands allowing them to produce the correct amount and quality of oil. The whole, painless procedure can be carried out in-office and takes just 12 minutes. Don’t let meibomian glands dysfunction go untreated. If you are concerned that you have any of the symptoms, get diagnosis and treatment quickly. Visit us at the New Jersey Eye Center in Bergenfield, NJ. Short Description: Very few of us have ever heard of Meibomian Glands Dysfunction (MGD). It is a very common eye condition, affecting many people who do not even realize they have it. Yet, if left untreated, it can lead to extreme discomfort and potentially cause permanent damage to sight. The condition is connected with the production of tears, which keep our eyes moist and healthy. They also affect the clarity of our vision. When there is an imbalance in the composition of tears, dryness, irritation, and blurred vision may occur.